Who was Jimi Hendrix before he became the greatest electric guitarist of all time? He was a young boy named James Marshall Hendrix, known as Jimmy and sometimes as "Buster" (after the actor who played Flash Gordon, a science fiction film hero)...and he was in love with sounds and colors. 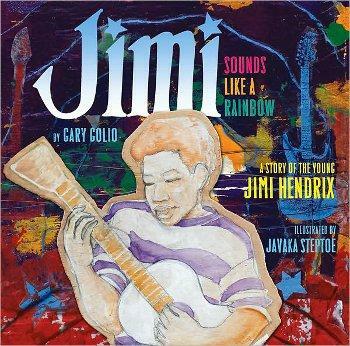 "I can see, my rainbow calling to me..."
"Golio's lyrical text sings with delicious description"
"Readers with hands itching for frets will be entranced"
"Javaka Steptoe's colorful mixed-media plywood art explodes off the page. His earthy, psychedelic folk art matches Golio's poetic treatment of his subject beautifully, capturing Hendrix's sound with arresting visuals."